3B Umpire Dan Iassogna ejected Padres Interim Manager Pat Murphy for arguing a balk non-call (reversed balk) made by 2B Umpire John Tumpane in the top of the 6th inning of the Padres-Rockies game. With two out and three on, Rockies pitcher Chris Rusin was called for a balk by Tumpane, who reversed the ruling after consultation with umpires Iassogna, Lance Barrett (1B) and CB Bucknor (HP). Replays indicate Rusin began his natural motion and continued delivery to home plate out of Windup Position and therefore did not violate balk provisions pertaining to the no-stop restriction that is applicable to Set Position, the (no-)call was correct. * At the time of the ejection, the Rockies were leading, 1-0. The Rockies ultimately won the contest, 5-0. This is Dan Iassogna (58)'s third ejection of 2015. Dan Iassogna now has 11 points in the UEFL Standings (8 Prev + 2 MLB + 1 Correct-Crewmate = 11). Crew Chief Dan Iassogna now has 2 points in Crew Division (1 Previous + 1 Correct Call = 2). *Rusin's continuous motion is legal if he pitches from Windup Position, but illegal with runners on base (a balk) if delivered from Set Position as a pitcher must stop with runners on base when bringing hands together (coming set) if using Set Position. Relevant Rule is 5.07(a) in 2015 OBR, or 8.01 in 2014 OBR. Windup Position: Established by (1) facing the batter, (2) pivot foot in contact with pitcher's plate/rubber, (3) the other foot is free. The free foot may be placed on the rubber, in front of the rubber, behind the rubber, or off to the side of the rubber. "From this position any natural movement associated with his delivery of the ball to the batter commits him to the pitch without interruption or alteration." Set Position: Established by (1) facing the batter, (2) pivot foot in contact with pitcher's plate/rubber, (3) other for in front of pitcher's plate, (4) holding the ball with both hands in front of his body and coming to a complete stop. A pitcher may not come Set after starting in Windup. The Stretch: If a pitcher makes "any natural preliminary motion," he shall assume Set Position before delivering the ball to the batter. In other words, a natural movement associated with delivery of the ball to the batter is a component associated with Windup Position; a natural preliminary motion that is distinct from a natural movement associated with delivery is a component of Set Position. From the MLB Umpire Manual: A pitcher may assume Windup Position by "facing the batter, hands apart, pivot foot in contact with the rubber, other foot free." Both feet must be squarely on the ground, and the pitcher is not required to assume a stationary position ("pause") before delivery if "any natural movement associated with the start of [his] delivery committees the pitcher to pitch." In other words, Tumpane called Rusin for a no-stop balk which would be the proper call had Rusin pitched out of Set Position. The decision to reverse the call was made after the crew determined Rusin was actually in Windup Position and, thus, not required to stop (and actually obliged by rule not to stop). 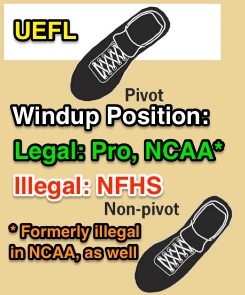 Note About Rules Differences (NFHS/NCAA/OBR): Pat Murphy, having last managed at the "big league" level (D1 or MLB) under NCAA rules, may be unfamiliar with the professional designation regarding Windup and Set-related balks. For instance, NFHS put out a POE on balking illegal hybrid stances while NFHS Rule 6.1.2 has umpires draw an imaginary line through the front edge of the pitcher's plate to determine whether the free foot is legally positioned (it must be even with or behind the line), while prior to 2015, NCAA Rule 9-1-a specifically stated in regards to Windup Position that, "The pitcher’s entire free foot shall not be in front of the pivot foot." Only in 2015 did NCAA change its rule to "with the other foot free." OBR/Pro obviously does not have the "not be in front of" restriction (quite the opposite, it explicitly allows the free foot to be placed in nearly any place relative to the pivot, and has for many years). This is one of several key rules differences that until very recently existed between College/Pro and still does exist between High School and the higher levels. In fact, when the NCAA Rules Committee changed Rule 9-1-a prior to 2015, it wrote in its rationale that the "other foot free" proposal "aligns more closely with the MLB pitcher windup position rule." This is the 163rd ejection of the 2015 MLB Regular Season. This is the 76th Manager ejection of 2015. This is the Padres' 14th ejection of 2015, 1st in the NL West (SD 14; LAD 7; SF 5; COL 4; ARI 3). This is Pat Murphy's 3rd ejection of 2015, 1st since August 10 (Tony Randazzo; QOC = Y [Balls/Strikes]). This is Dan Iassogna's first ejection since June 1, 2015 (Bud Black; QOC = Y [Balls/Strikes]).